There are a lot of new takes on L. Frank Baum's Land of Oz coming up, including Sam Raimi's Oz The Great and Powerful, and a new animated film featuring Patrick Stewart and Lea Michele. But the most unique takes might come from a new anthology, edited by John Joseph Adams and Douglas Cohen. Oz Reimagined: New Tales from the Emerald City and Beyond just sold to Amazon's 47North imprint, and is coming next February. In this anthology, the editors have recruited some of today's most popular and talented young adult and fantasy writers and asked them to re-imagine L. Frank Baum's classic creation. In these stories, you will be reintroduced to the world of Oz, but it will be Oz as you've never seen it before. Ever wonder what Emerald City would look with an urban fantasy makeover? Perhaps you want to know the origin of Dorothy's slippers, or maybe you want to know what happened when the Wizard first came to the Land of Oz. 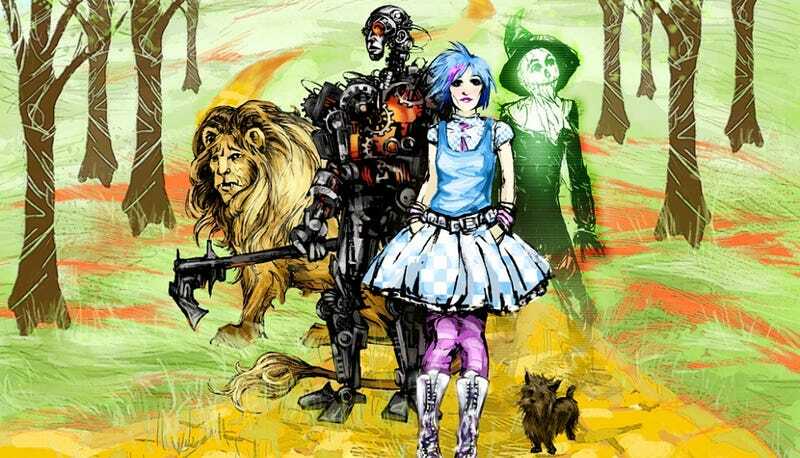 What if Dorothy never went to Oz at all, or the Land of Oz was actually a dystopian nightmare? All these scenarios and many more will be found in Oz Reimagined. At the helm of this project are John Joseph Adams-bestselling editor of more than a dozen science fiction/fantasy anthologies-and Douglas Cohen, former editor of Realms of Fantasy Magazine. Together, they will bring you stories by celebrated authors such as Orson Scott Card, Tad Williams, Jane Yolen, Seanan McGuire, Jonathan Maberry, Simon R. Green, David Farland, and many other terrific talents who have each reinvented Oz with their own unique visions. Along with a foreword by Gregory Maguire-renowned author of Wicked: the Life and Times of the Wicked Witch of the West-the anthology features a lineup not to be missed. Baum's original Oz books were always published with beautiful interior illustrations. Given that, it seemed appropriate to do the same for Oz Reimagined. And so we commissioned artist Galen Dara to provide the cover and an original illustration for each story in the book. Image: Draft cover art by Galen Dara.